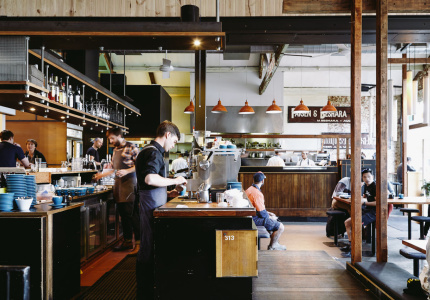 The man behind the Auction Rooms, Small Batch and a soon to open CBD venue created in collaboration with Broadsheet and Bank of Melbourne for The Keys, Andrew Kelly, gives a step-by-step guide to brewing the perfect filter coffee. And, although he’s not discouraging punters from dropping in for a latte, he is encouraging people to make a filter coffee in their own kitchen - but he wants you to do it right. He tells us how. The first thing about selecting coffee is that you want coffee that’s freshly roasted. You want to be able to identify the date of roast. Period of usage after roast is important. We really encourage use from day seven after roast, and there’s a two-week window. Day two after roast, the flavours just haven’t settled. Somehow the oils need to softly, slowly migrate to the outside of the bean so they’re more easily extracted. The carbon dioxide in the coffee just needs a chance to ease its way out. That seems to take about seven days. The acidity will be more toned down, and the sweetness will develop more. You want the beans to smell nice. If you squeeze the bag of beans and you’re smelling tobacco, and nutshell, and earth, and fermented fruit, and rubber, they’re not good beans for filter brewing. We’d like our beans to smell sweet, quite candy-like, like a lolly, with a little bit of fruit, and just the right amount of sugar browning - like the smells when you’re baking a cake. 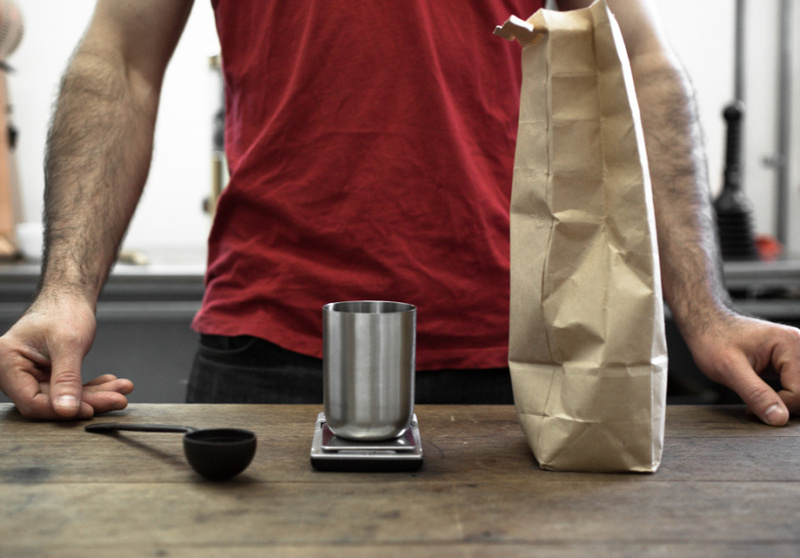 We start by weighing out the coffee for the amount you want to brew at the time. You want figure out what overall volume of beverage at the end, so working backwards you’ll work out the amount of beans you’ll need. You need to stick to a fairly strict ratio of 60 grams per litre of coffee. Then you can scale it any way you like. We use a recipe of 15 grams for 250mls of water. We strongly encourage the use of scales rather than volume measurements for everything. You can measure your beans and water on the same scale. Out of all the brewing equipment you could possibly own, the grinder is the one you should buy first. It’s hard to under-emphasise that. The aromatics of coffee will dissipate within minutes of grinding, especially within ten minutes to thirty minutes. We’re trying to capture all of those aromatics into the coffee, so when you bring the coffee up to your nose, that’s the smell you’re getting. So you need a home grinder. It needs to be a burr grinder, not a flat-blade, whizzy, spice grinder, because they pulverise the coffee and hack it. They give a massive inconsistency of particle size, which means you get some particles that are under-extracted and some that are over-extracted. Now we’re ready to go. The first step of a pour-over, a V60 in particular, is to assemble your gear. You’ll need the vessel to receive the beverage into, you’ll also need a paper, and a kettle. Firstly you start by wetting the filter with super hot water. Pour maybe 100ml over the filter, because you want to wet it and rinse it to get rid of some of the paper flavours. It’s important that you wet it because when you pour brewing water, you don’t want it to be conducted to the dry parts of the filter. We really want to saturate the coffee fast. Evenness and speed is key. Next, we pour out the water that’s in the dispensing vessel, reset the scales and introduce the coffee. Level it with a little shake, and make sure the water’s hot. Reboil it for five seconds. Start by introducing 50mls of water and start the timer. As soon as we’ve done that, grab a spoon and pretend you’re mixing concrete. The idea is to get maximum, fast, and thorough saturation. In the cafe, we have five applications of water, but in the home, we encourage you just to do three over a minute and a half. Go 50ml for the bloom, 100ml at one minute and 100ml at one-and-a-half minutes. That’s enough for two cups. We just want to let the water trickle slowly through the coffee. The higher the bed of water, the more force of gravity on the coffee. You don’t want it to go high water/low water/high water. The easiest way to do that is to use those intervals. It’s really basic - any home cook could use the same logic. We’d start allowing 30 seconds for the first pour, then add 100ml, then at a 1.30, we’d add another 100ml. Ideally, at a minute, there will still be a little bit of water at the top of the bed. It’s also important that you pour gently, because you don’t to disturb that bed of coffee, or create divots that the water can flow through more easily. 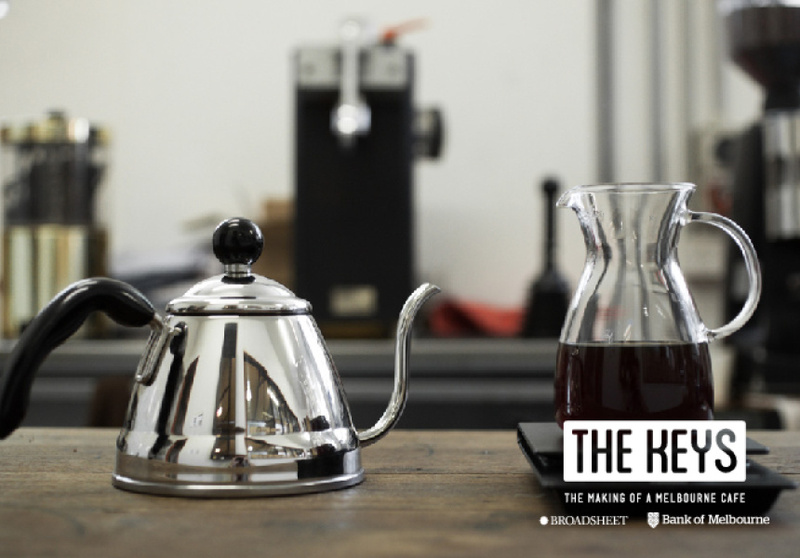 We’re following Andrew’s path creating a new cafe in the CBD for The Keys. Find out more at bankofmelbourne.com.au/broadsheetthekeys.